The presence of the G8 in Ireland must be actively opposed by republicans, socialists and other progressives. 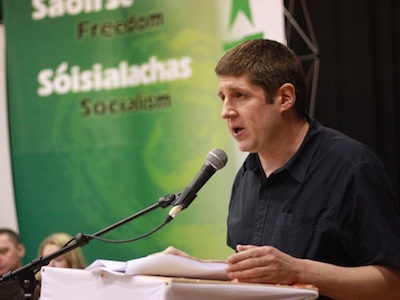 By hosting the G8 summit in occupied Ireland, the British government are attempting to portray our country as a peaceful colony – a success story for modern day capitalism and imperialism. Like the visit of Elizabeth Windsor to the Twenty-Six Counties in 2011 or the naming of Derry as the 2013 ‘UK City of Culture’, the hosting of the G8 in Ireland has to be seen in the context of the British government’s ‘normalisation’ strategy. For decades Britain has attempted to portray the relationship between Ireland and Britain as a normal one. Nothing could be further from the truth. Britain continues to occupy and claim jurisdiction over six Irish counties and enforces that occupation with 5,000 combat troops, 9,000 paramilitary police and hundreds of MI5 operatives and spies. For as long as British imperialism claims jurisdiction over any part of Ireland, the relationship between the people of these two islands will never be ‘normal’. Ireland, north and south, has been crippled by the failed policies of neo-liberalism and austerity. The G8 states effectively control both the EU and the IMF, institutions which have inflicted untold suffering on the peoples of not just Ireland, but Europe and beyond. Despite all of the spin to the contrary the G8 summit is in essence a planning meeting for the global ruling elite, a meeting that will result in further attacks on the rights and living conditions of working people everywhere. The world’s eyes will be on Enniskillen next week. Those who are organising the G8 summit hope to present an image of an Ireland at peace with the British occupation, with capitalism and with austerity. It is up to the people of this country to ensure that another image is presented to the world; the image of a people who are far from content; a people who are no longer willing to accept the diktats of the ruling elite of the G8 and the Troika; a people who are taking a stand against the austerity policies of Westminster, Leinster House and Stormont. I would encourage anyone who is opposed to imperialism and capitalism, to occupation and exploitation, to cutbacks and austerity, to environmental destruction and corporate fascism to make their way to Enniskillen for 7pm next Monday and join with us in sending a message to the G8 and the world – this is Ireland and we do fight back! 13th-16th June: Another World is Possible - A weekend festival in opposition to the visit of the G8 to Ireland. See https://www.anotherworldispossiblebelfast.org for more info. 15th June: Civil groups such as the trade unions, ICTU, Amnesty, Friends of the earth, IPSC have organised a response to the G8. Assemble 12 noon Custom House Square. Rally at Belfast City Hall. Rally ends at 2.00 p.m. following which there will be a number of events in the city focusing on different issues. 16th June: The SWP is organising a “counter-summit” in Belfast. See website for details. 17th June: March Against the G8. March and rally against the G8 meeting in Ireland. Assemble at Enniskillen library, Halls Lane, Enniskillen, Fermanagh, at 6.30pm. Everyone urged to attend. 17th June: The Socialist Party will be organising a bus for the march in Enniskillen (see website for details), as will the SWP (for details phone 0876574100).